The Next Three Days is an odd movie with an intriguing concept that wastes a lot of its potential on the way. The story of John Brennan (Russell Crowe) who wants to break out his wife (Elizabeth Banks) from prison raises questions of plausibility, but they can be disregarded because you can’t argue too much with realism in a Hollywood movie. The movie’s problem lies more with its lack of focus and character development. It’s a case of too much and not enough. It’s mostly suspenseful and Russell Crowe does a really good job, but the movie leaves him hanging pretty often. 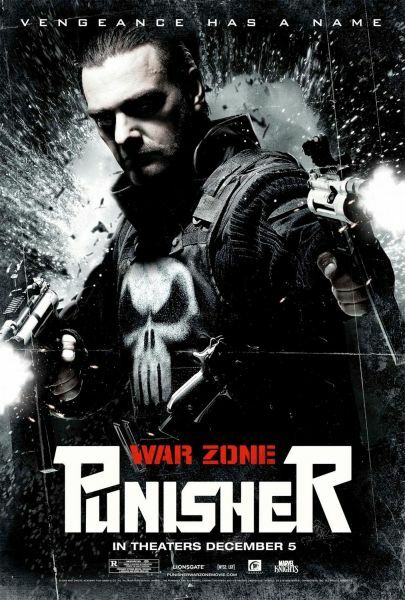 Punisher: War Zone. I mean, the title alone asks for trouble. Let me just say that as much as I’m a comics fan, even a superhero comics fan, The Punisher is a character I really loathe. Frank Castle’s family was killed by gangsters, so he kills gangsters now as the Punisher. He is the ultimate vigilante, showing that our laws don’t work, because they always let the bad ones go. Most of the time it’s an excuse for lots of violence and shooting and torturing, etc. I haven’t read a lot of his comics, but most of them are like that, even if there are exceptions (Mark Millar of all people seemed to have understood that Frank Castle is insane when he wrote him in Civil War). The first (or second if you remember Dolph Lundgren) movie was as you could have expected, telling the basic story and having lots of cruel violence. It wasn’t great. But now this one wants to take it many steps further. I respect director Lexi Alexander because she is very outspoken about women in the movie business and says things most people don’t even think about. But this movie is awful. This might be due to some difficulties with the studio, so I don’t want to put all the blame on her, but it is what it is.